‘Waiting for Superman’ is a new documentary about public education in America that is already stimulating a lot of discussion about how to ‘fix’ the ailing education system. There’s no need to ‘wait’. It is being fixed in hundreds, if not thousands of schools around the nation such as the Durham Nativity School in Durham, North Carolina. For the past 40 years, Americans increasingly have taken the task of educating their children into their own hands and not ‘waited for Superman’ or the federal, state or local governments to provide better education for their offspring. Private schools have always been around for parents who could afford it and Catholic parochial schools used to be the main alternative for parents to consider enrolling their children when they started to do poorly in the public system. The ‘home-school movement’ started to take root in the 1970’s and early 1980’s in a big way and Protestant churches started Christian schools by the boatload about the same time when parents grew ever more fearful that little Johnny and Joanie were not going to learn as much as they wanted them to learn in the public education system in their local towns. We love public education and went to public schools and our sons all went to public schools. There are tons of great things going on at many public high schools in this nation, many of which go unreported because it is not 'sensational' enough in a negative way to warrant a news story. Thomas Jefferson believed great public schools are critical to our democratic republic based on the free enterprise engine and who are we to argue with Mr. Jefferson? However, it is becoming increasingly very hard to see how each and every child can blossom and perform at their highest level possible in a manufactured box of a high school with 3000+ students when most experts assert that the optimum size for a high school is around 1200; for middle schools,around 800 and for elementary schools, around 600. Kids just get ‘lost’ in such large populations and fall by the wayside due to lack of connection or contact with their teachers. Or they just become ‘invisible’ and start to believe no one really cares about whether they learn anything or not. The dropout rate is 50% for African-American males in American today meaning only 1 out of every 2 African-American males who start the 9th grade finish the 12th so something 'not great' is going on here. When a 4000-student high school puts only 12 players on the basketball court for the male or female varsity teams, that means at least 72-80 other students don’t get a chance to learn the basic lessons of hard work, sacrifice and teamwork that comes with being on a varsity basketball team at a school with only 1000 students which serves them well for the rest of their lives, in most cases. This is their 9th anniversary year. 97% of all their students from 6th-8th grade are African-American or Hispanic, 80%+ of whom qualify for the school lunch program. More than a few of them come from downtown areas of Durham where drug trafficking and gunshot wounds are just a fact of life, not some story in the local newspaper or on the evening news. This past spring, the entire graduating 8th grade class was accepted to prestigious private schools in North Carolina such as Durham Academy, Cary Academy or the Asheville School. One was accepted to Woodberry Forest School in Orange, Virginia where many of the business, finance, legal and government leaders in North Carolina and around the Southeast have gone to prep school over the ages. The first graduating middle school class from DNS in 2004 is now in the second year of college at places such as NC State, Elon, North Carolina A&T and Belmont Abbey. One student who was Vice-President of his senior class at Durham Academy last year was accepted and is now enrolled at High Point University. Who needs 'Superman' when these sorts of things are already happening at Durham Nativity School? There are hundreds, if not thousands of private and charter public schools where such results are now considered ‘routine’, not exceptional. The KIPP School (Knowledge is Power Program) in northeast Charlotte, North Carolina is another prime example of what happens when you let a group of motivated headmasters and teachers focus their attention on teaching students of any color, background or socio-economic circumstance and challenging them to learn more than they ever thought they could learn. And not bog them down with multiple duties of being a policeman/social worker/child psychologist while simultaneously expecting them to also be a ‘miracle worker’ like Helen Keller’s teacher, Annie Sullivan. Teachers, public and private, are not supposed to cure all the ills that face us as a nation. We just want them to teach students how to read and write, add and subtract at the very minimum. Don’t you think some first grade teacher should have taught the President and all currently-sitting Members of Congress and the U.S. Senate how to count and add and subtract so they could balance budgets nowadays? Here’s a telling statistic that is almost too hard to believe: close to 2.3 million Americans now reside in ‘public housing’ called the US federal/state penitentiary system. A disproportionate share of them are African-American males. We spend, collectively, close to $70 Billion-with-a-Capital-B per year just to house these prisoners, or about $35,000 per capita. On death row, these inmates cost over $100,000 per year to house, feed and make sure they don’t escape for the rest of their lives. That could be 60 years for some men. $6 million in lifetime expenses paid for by the taxpayer for a life gone bad. 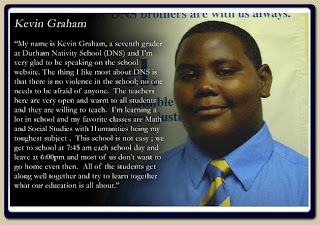 Do you think there is any chance even just 1 bad outcome could have been averted had a Durham Nativity School or KIPP program been nearby that he could have enrolled in at age 12 in the 6th grade? Think about that for a minute and let that one budget number sink into your cerebral cortex as deeply as it can set. 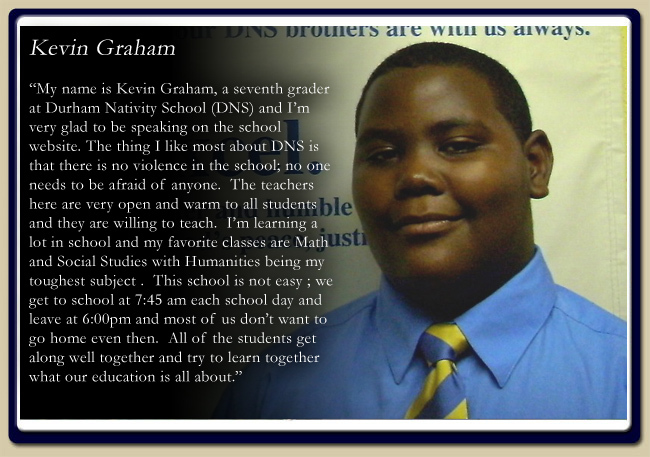 And then go on-line and look at the websites for the Durham Nativity School http://www.durhamnativity.org/ or the Charlotte KIPP School http://www.kippcharlotte.org/ or any school like that near you in your city or community. And then go over there to see what is going on first. You will then be drawn in to volunteer to help as a mentor or make the most basic of investments by contributing financially to their efforts since so much of their funding comes from private sources. We don’t need to ‘wait for Superman’ anymore. He is already here and he is going to these schools like Kevin Graham pictured above dressed up in a blue and gold-striped necktie and khaki pants. Go see them and shake their hands...and help them out. Could not agree more. There are many, many independent schools (day and boarding) and charter schools that are already getting it done. The kids are thriving, the faculty are engaged, the opportunities are bountiful. North Carolina is fortunate to have many strong choices to choose from. Thank you for your article. you are welcome....there has to be a way to scale this up and help hundreds and thousands more kids with this sort of direct, face-to-face interactive teaching and mentorship. it is not much more expensive than what it takes to educate other kids in the NC public ed system. There is very little overhead; the building is virtually free and all the resources are focused on paying and helping teachers teach our kids. Isn't that what it is all about?